Got some more inspiration for you on the STAMPlorations blog today. This yummy image is from The Bee's Knees World Birthday Cakes. I just added a hint of shading using Black Soot, Mustard Seed for the candle flames, and a bit of Dried Marigold for the icing around the base. The background is designer paper - I need to reduce the mountain of it! 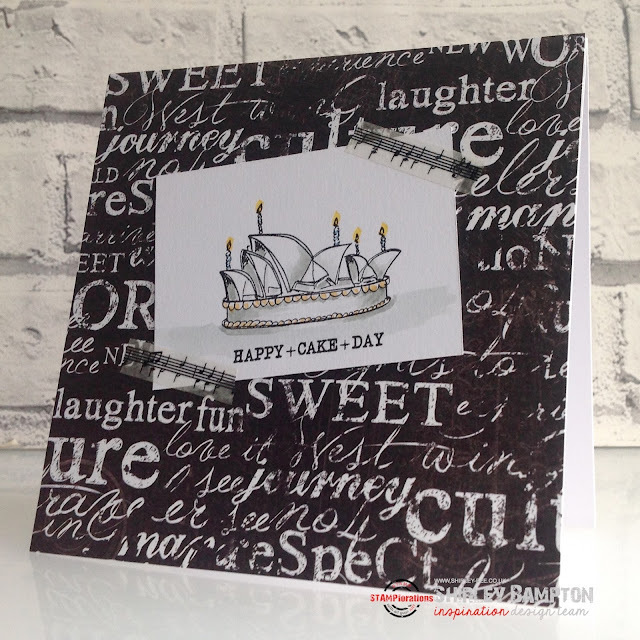 Pop on over to the STAMPlorations blog for more fabulous inspiration from the Design Team, and if you want to CASE this or any of the DT cards, link it up to the CASE playground for a chance to win prizes. When I saw this on the DT blog, my first thought was "looks like a poster on a graffiti-ed wall." So cool. What a fun card. Seems we all have a stack of DP to use before buying more. Like the music notes and that very fancy cake - Perfect for a male card.